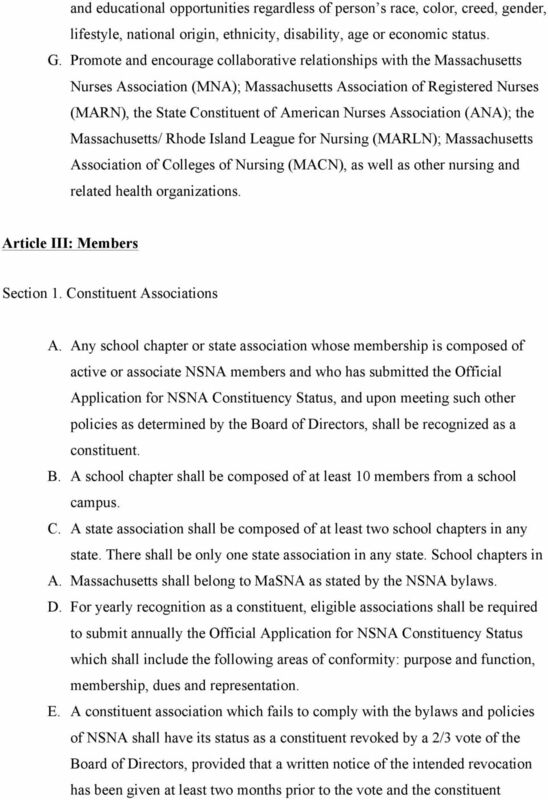 Download "MASSACHUSETTS STUDENT NURSES ASSOCIATION BYLAWS"
4 student when membership in a constituent association is not available. 2. Individual members shall have the privileges of membership as described in Article III, Section 2, items A and B. D. Active, associate and individual membership shall be renewable annually. Section 3. Categories of Non-Constituent Membership A. Sustaining Members: 1. Upon approval of the Board of Directors, sustaining membership shall be open at the MaSNA level to any individual or organization interested in furthering the development and growth of MaSNA. 2. This membership category is not open to those eligible for active or associate membership. 3. Sustaining members shall receive literature and other information from the MaSNA secretary. B. Honorary Members: 1. 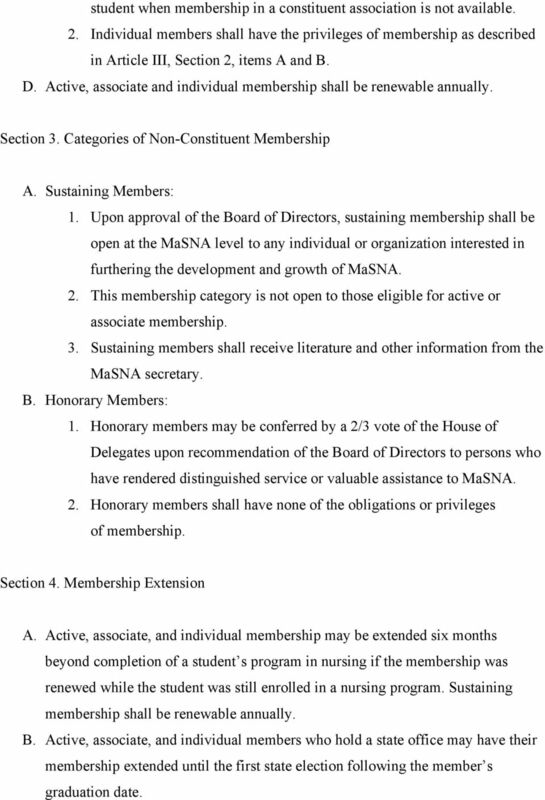 Honorary members may be conferred by a 2/3 vote of the House of Delegates upon recommendation of the Board of Directors to persons who have rendered distinguished service or valuable assistance to MaSNA. 2. Honorary members shall have none of the obligations or privileges of membership. Section 4. Membership Extension A. Active, associate, and individual membership may be extended six months beyond completion of a student s program in nursing if the membership was renewed while the student was still enrolled in a nursing program. Sustaining membership shall be renewable annually. B. Active, associate, and individual members who hold a state office may have their membership extended until the first state election following the member s graduation date. 6 have the privileges of active membership shall be eligible for the offices of the president or first vice president. B. Only members who shall be nursing students throughout at least three quarters of a term of office and have privileges of active or associate membership shall be eligible for all other offices. 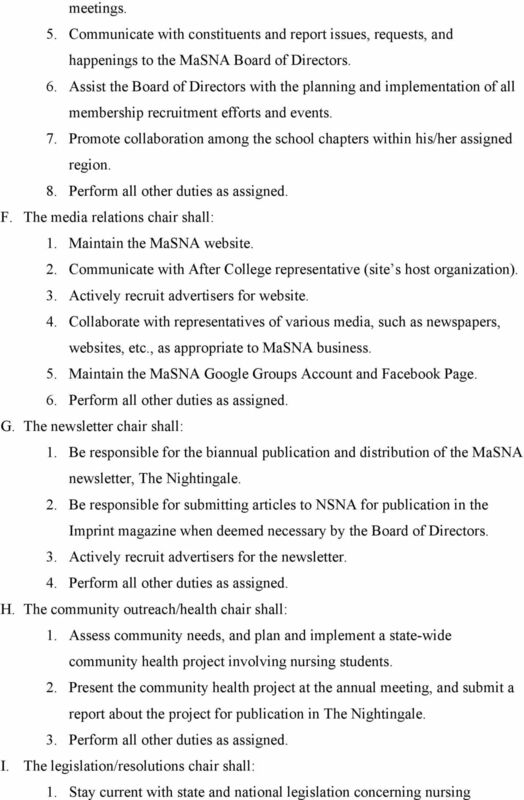 C. Faculty members at an accredited school of nursing or members of the nursing community deemed qualified by the Board of Directors may serve as faculty advisors to MaSNA. Section 3. Term of Office A. The term of office shall be one year from the adjournment of the spring meeting at which officers and directors are elected to the adjournment of the spring meeting at which their successors are elected. B. 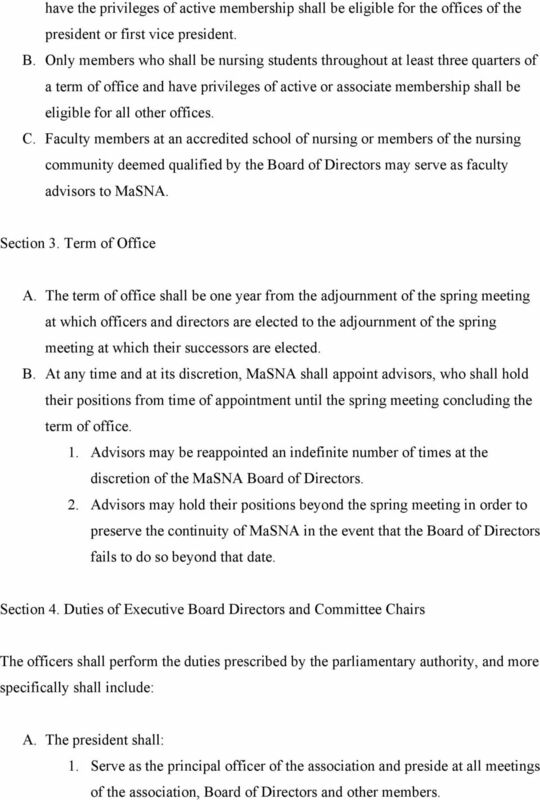 At any time and at its discretion, MaSNA shall appoint advisors, who shall hold their positions from time of appointment until the spring meeting concluding the term of office. 1. 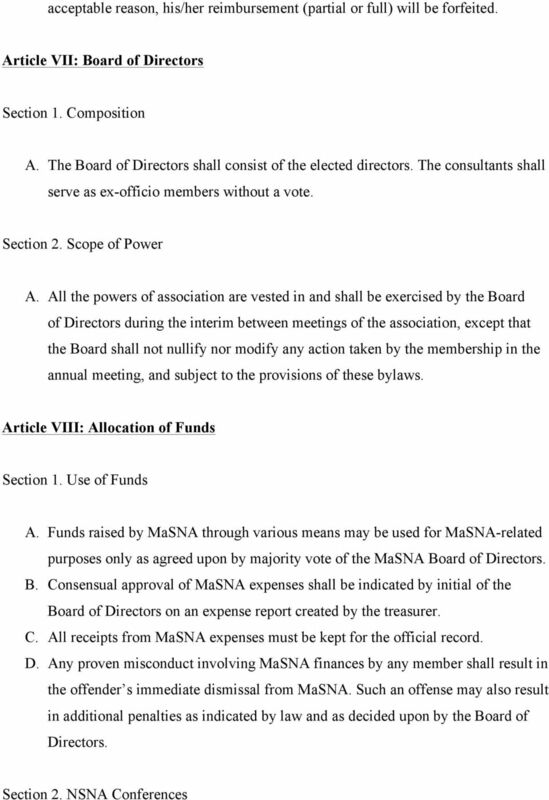 Advisors may be reappointed an indefinite number of times at the discretion of the MaSNA Board of Directors. 2. 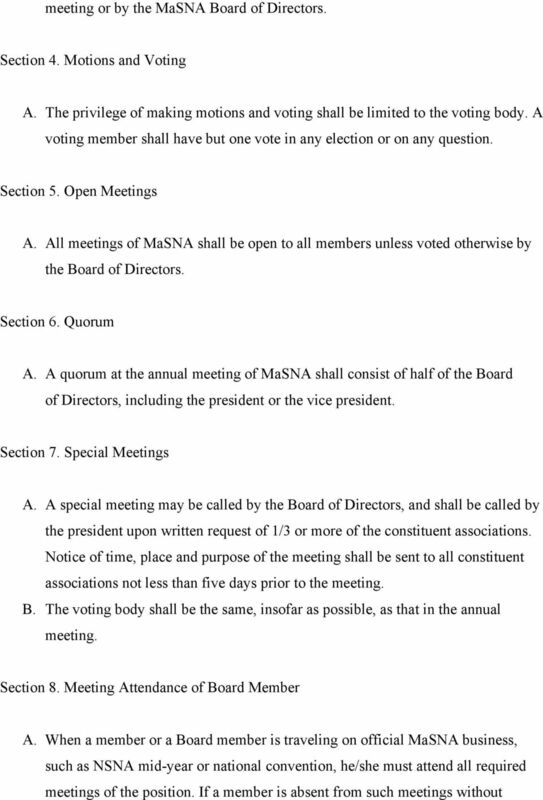 Advisors may hold their positions beyond the spring meeting in order to preserve the continuity of MaSNA in the event that the Board of Directors fails to do so beyond that date. Section 4. 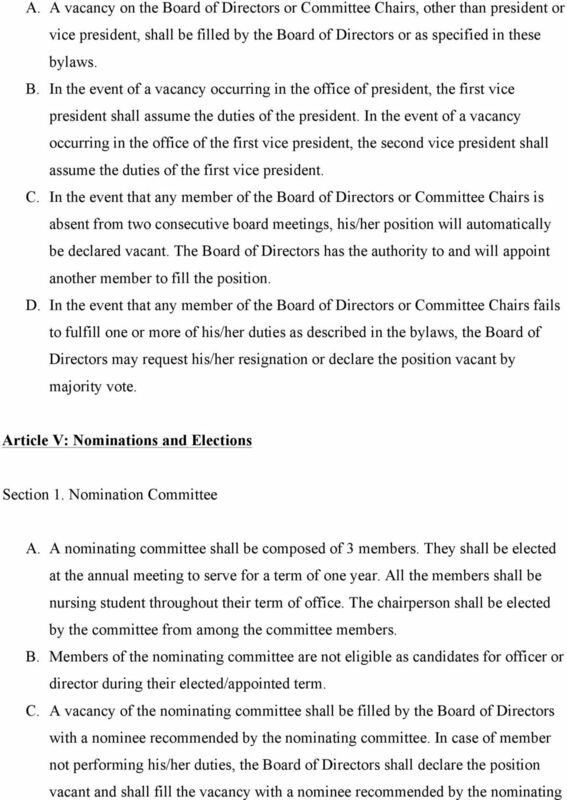 Duties of Executive Board Directors and Committee Chairs The officers shall perform the duties prescribed by the parliamentary authority, and more specifically shall include: A. The president shall: 1. Serve as the principal officer of the association and preside at all meetings of the association, Board of Directors and other members. 7 2. Ensure decisions of the Board are carried into effect. 3. Appoint special committees, when deemed appropriate, with the approval of the Board of Directors. 4. Serve as ex-officio member of all committees except the Nominating and Elections committee. 5. Represent MaSNA in the matters relating to the association and perform all other duties pertaining to the office. 6. Approve expenditures as submitted by the treasurer and authorized by the Board of Directors. 7. Have such other powers and perform such other duties as may be assigned by the Board of Directors. 8. Perform all other duties pertaining to the office. B. The vice president shall: 1. Assume the duties of the president in the absence or disability of the president. 2. Hold office of the president in the event of a vacancy. 3. Create the agenda for MaSNA meetings. 4. 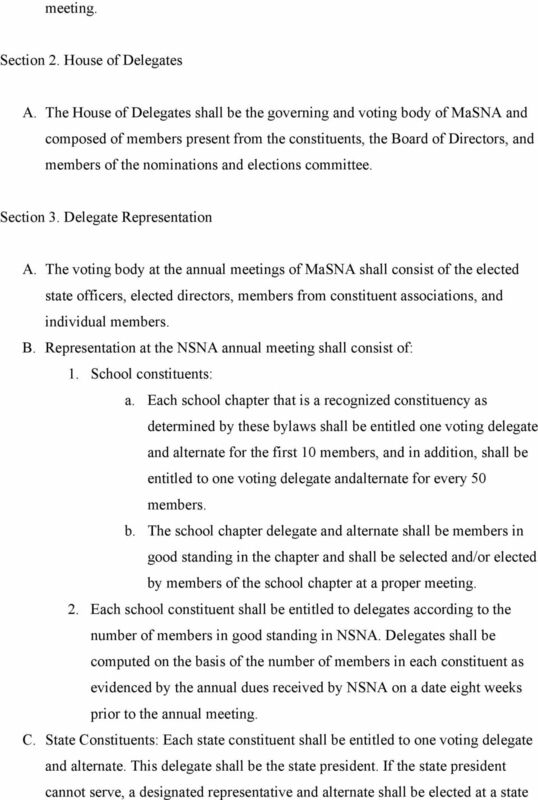 Submit the official application of constituency to NSNA by the deadline date. 5. Represent MaSNA at events related to association business, as appropriate. 6. Perform all other duties as assigned by the president. C. The secretary shall: 1. Record minutes of all Board of Directors meetings. 2. 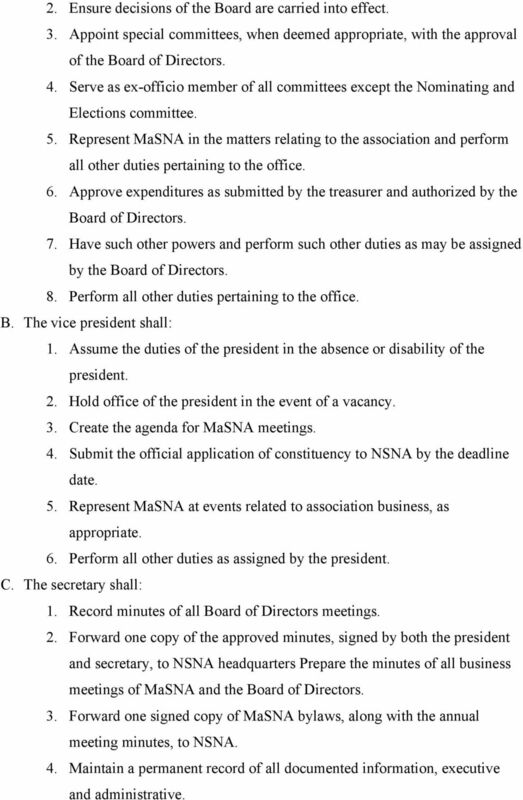 Forward one copy of the approved minutes, signed by both the president and secretary, to NSNA headquarters Prepare the minutes of all business meetings of MaSNA and the Board of Directors. 3. 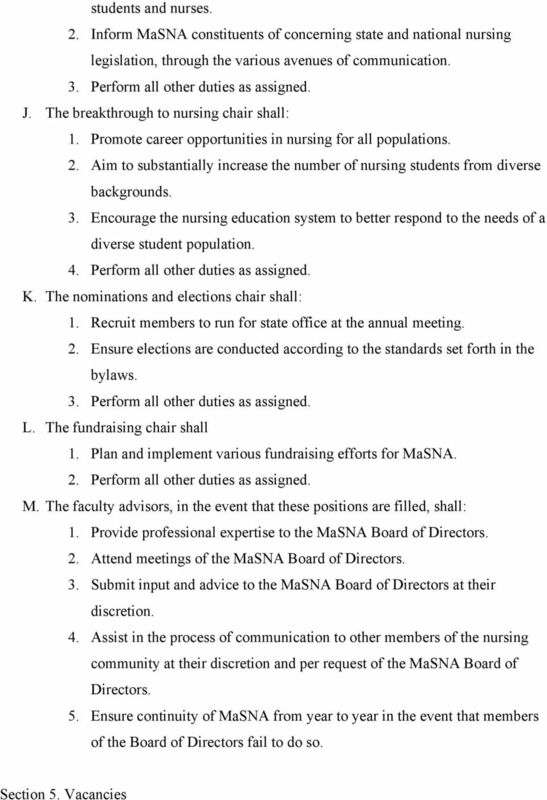 Forward one signed copy of MaSNA bylaws, along with the annual meeting minutes, to NSNA. 4. Maintain a permanent record of all documented information, executive and administrative. 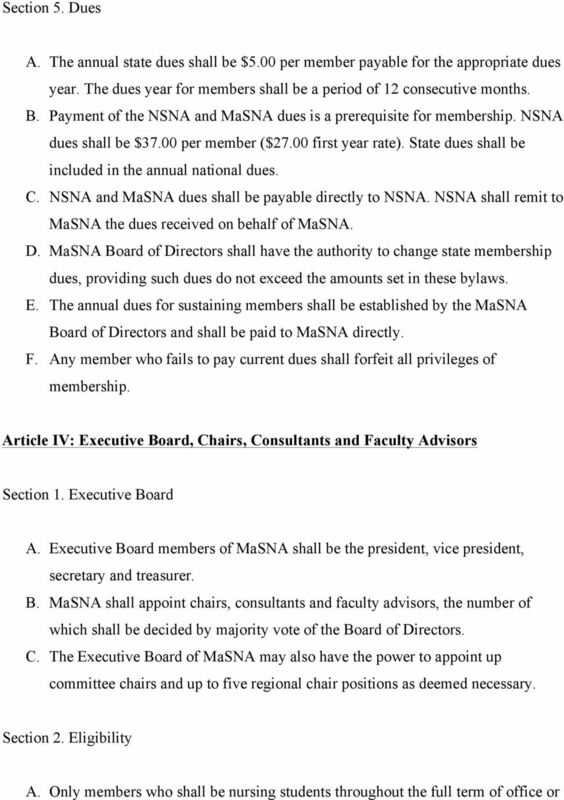 16 A. MaSNA funds shall subsidize a percentage of expenses for the NSNA Mid-Year and Annual Conferences. B. The Board of Directors shall review the budget for the year and unanimously decide the percentage of expenses that will be covered by MaSNA dollars. The number of Board members attending any conference will be decided by the Board of Directors unanimously. 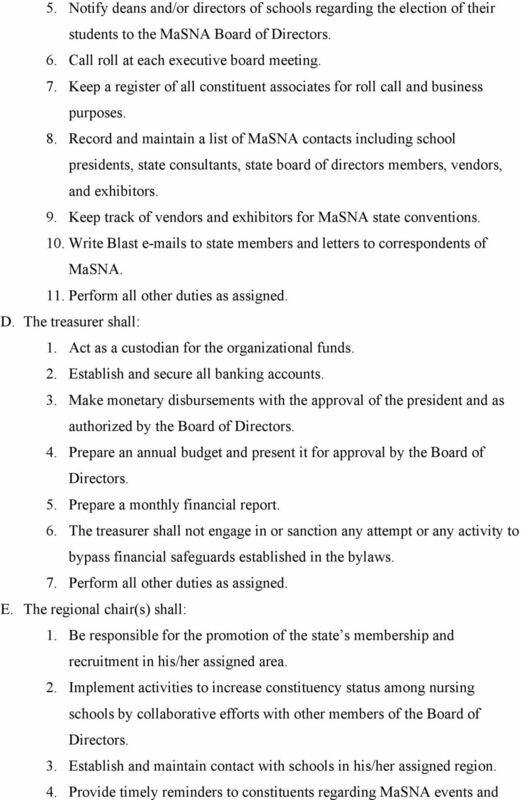 Each member of the Board attending a conference shall have his or her expenses covered in part by MaSNA dollars. 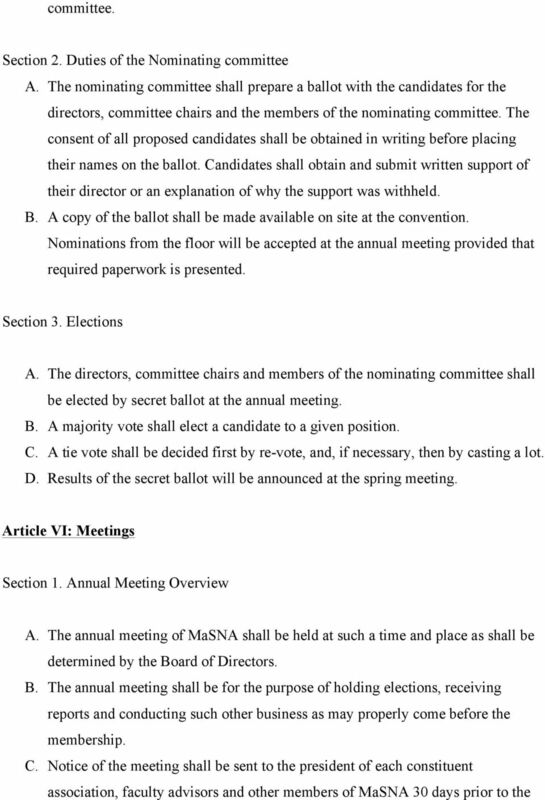 The president and appointed voting delegate(s) shall hold priority for attendance at NSNA conferences. 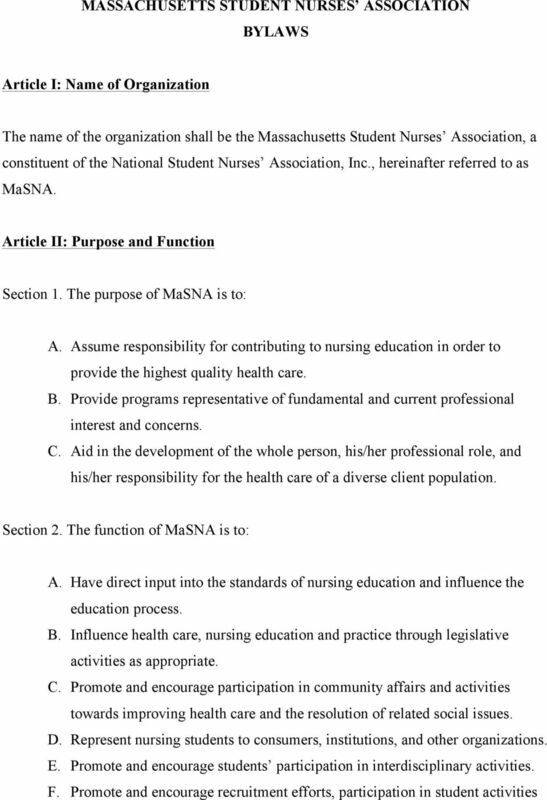 National Student Nurses Association Mercy college of Ohio Handbook ARTICLE I - NAME OF ORGANIZATION Section 1. The name of this organization shall be the Mercy College of Ohio Student Nurses Association. 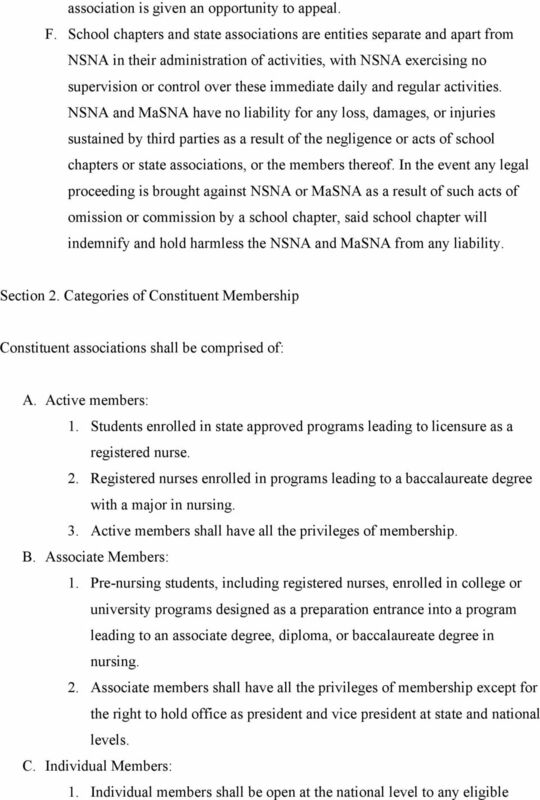 UTAH STUDENT NURSES ASSOCIATION (USNA) BYLAWS Article I Name of Organization The name of this organization shall be the Utah Student Nurses Association (USNA). Article II Purpose and Function Section 1. WOR- WIC COMMUNITY COLLEGE NURSING STUDENT ORGANIZATION. The name of this organization shall be the Wor- Wic Nursing Student Organization. Bylaws of the Society of Financial Service Professionals, Seattle Chapter ARTICLE I Name and Purpose The name of the corporation shall be the Society of Financial Service Professionals, Seattle Chapter. BY-LAWS OF THE MARYLAND PUBLIC PURCHASING ASSOCIATION, INC. The Association, founded in 1913, shall be named The Potato Association of America, hereafter referred to as The Association. ARTICLE I NAME The name of this component State Association of the American Health Information Management Association (AHIMA) shall be the Ohio Health Information Management Association, Incorporated. Article I - Name and Address The Parent Support Organization, also known as PSO, serves the Orange County High School of the Arts (OCHSA) and is located at 1010 North Main Street, Santa Ana, CA 92701. THE WHARTON BUSINESS SCHOOL CLUB OF NEW JERSEY, INC. Bylaws of the. Society of Financial Service Professionals, Eastern New York Chapter ARTICLE I. Name and Purpose ARTICLE II. Aug 10, 2013 By-Laws ARTICLE 1 MEMBERSHIP CLASSES OF MEMBERSHIP Membership shall consist of nine classes: active, members-at-large, life, retired, sustaining, affiliate, student, honorary, and associate. BYLAWS OF THE WOMEN LAWYERS ASSOCIATION OF MICHIGAN ARTICLE I Name and Purpose Section 1. Association Name. The name of this Association shall be Women Lawyers Association of Michigan ( Association ). Illinois Society of Medical Assistants Bylaws Page 1 Table of Contents MISSION STATEMENT.3 CMA (AAMA) CORE VALUES:. 3 ARTICLE I - NAME: 4 ARTICLE II OBJECTIVES/PURPOSE: 4 ARTICLE III - ORGANIZATIONAL POLICY:..
BROWARD AMATEUR RADIO CLUB, INC. BY-LAWS (As Adopted, November, 2011) 1.1 The name of the organization is: Broward Amateur Radio Club, Inc.
Directors may, from time to time, direct. BYLAWS OF THE TEXAS ACADEMY OF FAMILY LAW SPECIALISTS Article I Officers Section 1. Officers. The Officers shall be the President, President-Elect, Vice- President, Secretary and Treasurer. Section 2. INDEPENDENT INSURANCE AGENTS & BROKERS OF NEW YORK, INC. BY-LAWS AS AMENDED 2014 Article I The name of this organization shall be the Independent Insurance Agents & Brokers of New York, Inc. (IIABNY). CONSTITUTION & BYLAWS of Alabama Insurance Society. ARTICLE I Name. The name of the organization shall be the Alabama Insurance Society. Article I Name Section 1: The name of this group shall be the Pennsylvania Coalition of Nurse Practitioners, herein referred to as PCNP. Article II Purpose Section 1: The purposes of PCNP shall be: 1. BYLAWS OF THE KANSAS CITY CHAPTER OF THE CONSTRUCTION SPECIFICATIONS INSTITUTE, INC.
ISU ARCHERY CLUB CONSTITUTION 2010-2013 Article I. Name The name of this club shall be The Iowa State University Archery Club of Iowa State University or ISU Archery Club or ISAC for short. Article II. The name of this organization shall be The International Women s Club Bermuda (hereinafter known as the IWC ).